If you want to make the best Marinated Grilled Shrimp ever, here are some very easy tips to follow. Many people have asked the question, "How do I marinade shrimp?" It’s quite simple really. You first need to find a good recipe for a Grilled Shrimp Marinade. There are so many recipes available so you just need to find the best marinated grilled shrimp recipes to suit your taste. Check out the ingredients, do the flavorings appeal to you? Although many recipes are specified for marinated grilled shrimp, you can use any Shrimp Marinade recipe and grill it, pan-fry it, or bake it. Just because the recipes call for grilling the shrimp you don’t always have to follow that. You can use an electric indoor grill like the George Forman or bake the marinated shrimp in the oven. Pan-frying the marinated shrimp is another option you can do, especially on rainy days! 1. Purchase Raw fresh or Frozen Shrimp. I highly recommend Large or Extra-Large Shrimp for grilling purposes. Also, it is best not to purchase pre-cooked shrimp because you are going to be cooking it again on the grill. You don't want it to end up too tough. Raw shrimp only takes a coulpe of minutes to cook. For the best results, and too avoid chewy shrimp, always start with Raw Shrimp. 2. Clean and Devein Shrimp – this is assuming you bought shrimp in the shell. (If you bought shelled-deveined shrimp, skip this step.) Hold your shrimp under cold running water, then remove outer shell and legs. Leave tail in tact. Next, make a small slice along the center back of the shrimp and with the tip of your knife, gently remove the black vein. Rinse shrimp and set into a clean bowl. Repeat these steps until all of the shrimp are done. 3. 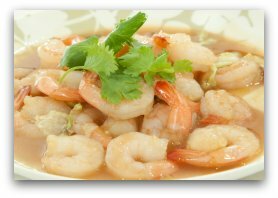 Drain any excess water from bowl of cleaned shrimp. Pat dry with paper towels to soak up any excess water remaining on shrimp. 7. Remove the shrimp from the fridge, uncover it, pour marinade over shrimp and gently stir shrimp to coat completely. Recover tightly and return to fridge. 8. Marinade the shrimp for approx. 1 hour or follow recipe instructions for best results. 9. When the marinade time is almost complete, pre-heat your grill to a medium – high heat. 10. Skewer shrimp or place in grilling basket, grill according to recipes instructions and enjoy the Best Marinated Grilled Shrimp ever! The best skewers recommended by free-shrimp-recipes.com are the Forpro Products Co 4-pc. Double Kabob Skewers. They prevent the food from spinning around on the skewer and they hold the food on better. Place 1 pound raw shelled shrimp in re-closable plastic bag or container with tight lid (I prefer to usemarinade containers like the tupperware one. They are easy to flip during marinading), add marinade. Close, refrigerate 2-4 hours. Drain marinade. Thread shrimp onto pre-soaked skewers.Grill over hot coals 6-10 minutes. Brush often with reserved marinade. Mix marinade in shallow bowl, add shrimp, cover, refrigerate for at least 3 hours, turning occasionally. Set grill on high heat. Skewer shrimp and lemon slices on bamboo skewers, alternating each. Grill until shrimp just become opaque. Baste occasionally with leftover marinade. Grill approx.3 minutes per side. Marinate shrimp for 1/2 - 1 hour. Thread shrimp on skewers and grill. Reserve marinade for dipping. If you want really easy and fast, purchase a bottle of pre-made seafood marinade. like Lawry's Tequila Lime or Caribbean Jerk, from your local grocery store or if you're like me (I buy a ton of stuff from amazon...I love shopping online! ), and marinade the raw shrimp for approx. 1 hour before grilling. Just because it's fast and easy doesn't mean it can't make the best marinated grilled shrimp! This article is brought to you by Beth Brawn, creator of https://www.free-shrimp-recipes.com You can visit her website for many more delicious Marinated Grilled Shrimp recipes along with many other shrimp cooking tips, cooking videos and more. Copyright- You may freely republish this article, provided the text, author credit, the active links and this copyright notice remain in place. Check out our Grilled Shrimp Recipes Page and Grilled Shrimp Kabobs Page to find your favorite Marinated Grilled Shrimp Recipe. Return to Articles Page from How To Make The Best Marinated Grilled Shrimp.